All of the following modules use our quick start foundation which allows us to do rapid prototyping of your project. To get an idea of what your project might cost, here are some prices for the various components. A 'section' is a database table or area we need to manage or track. We would be happy to customize any of our packages and tailor it to your exact project needs. Optional user management and logging. 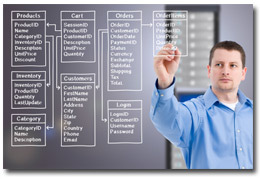 The database can be customized to your needs (specific tables for different sections). Each section is fully searchable within the admin interface. Expandable to meet future needs. Includes 5 hours of database configuration. Includes 15 hours of database configuration. Joomla Administrative functionality -- Have your project maintainable within Joomla itself! PDF generation -- Generate content on top of your existing forms. Have the database fill in your invoices! Mobile Web Versions available for your projects. Update your database or see your schedule from your phone! Mobile Apps -- Directly talk to your database on your phone. Customized results or interfaces available. Gallery -- Display complex portfolios of your artwork, easily manageable! Wordpress -- Have part of your website devoted to your blog. Keep your content fresh!